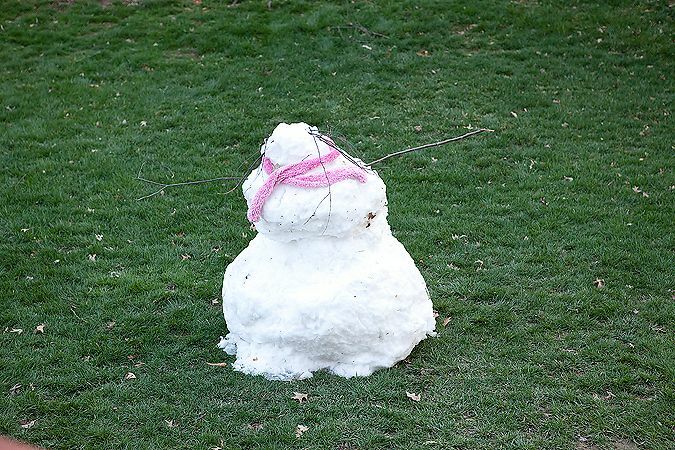 It is the Monday after spring break, and I feel a bit like our snowman there. Head hanging, body dragging, I pull myself out of bed and glare at the alarm clock. Being up this early is as wrong as the freak snowstorm that invaded our city over the weekend. The cruelty of the early hour hangs over my heart like the snow that hangs on the newly-sprouted blossoms in my yard. My hair is as tangled as the matted sticks adorning the snowman's head. My bottom is equally, ahem, proportionate thanks to a week of eating treats with my kids. I feel soggy, out of place, and long to just melt back into bed. When, oh when is summer vacation?